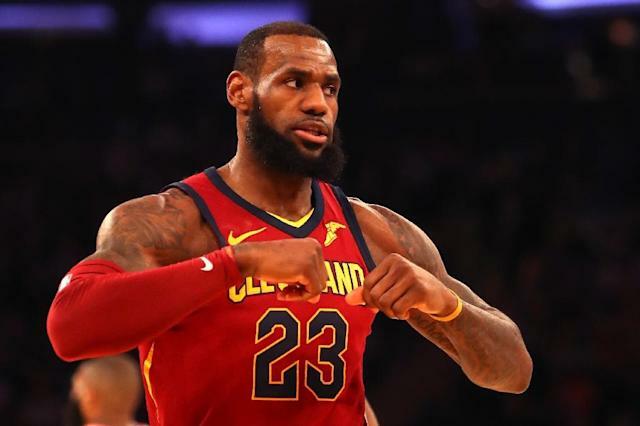 Washington (AFP) - LeBron James is on the verge of reaching the NBA Finals for an eighth consecutive season, but his Cleveland Cavaliers face a familiar and formidable obstacle in the Boston Celtics. The Cavaliers visit Boston on Sunday for the opening game in the best-of-seven Eastern Conference Finals, with the winner to face either regular-season pace-setter Houston or defending champion Golden State in the NBA Finals. Four-time NBA Most Valuable Player James has carried the Cavs on his back at times, averaging 34.3 points, 9.4 rebounds and 9.0 assists in 11 playoff games for the Cavaliers, who edged Indiana in a seven-game first round before sweeping Eastern conference top seed Toronto in the second round. "LeBron is on just a ridiculous run," said Celtics coach Brad Stevens. "We know it will be quite a challenge." James has averaged 24.0 points, 10.3 rebounds and 8.3 assists against the Celtics this season as Cleveland won two of three meetings. "At the end of the day, you have to do whatever it takes to win," James said. "It doesn't matter how it happens." "King James" would share fourth on the all-time list by reaching his eighth consecutive NBA Finals, two shy of Bill Russell's record run from the 1960s Celtics dynasty team and trailing nine in a row by Russell teammates Sam Jones and Tommy Heinsohn. James went 2-2 in the finals with Miami from 2011-2014 and 1-2 with Cleveland the past three years, all against Golden State. He's 3-5 in the finals overall, having also lost with the Cavs in 2007. "Every time we come to the playoffs he has that edge," Cavs coach Tyronn Lue said of James. "He's a special player, and we all know that. What he does for us is big." The 33-year-old playmaker, whose dream came true in 2016 as he sparked the Cavaliers to ending Cleveland's 52-year pro sports title drought, is the maestro of a deep corps of role players led by forward Kevin Love, whose aggressive play has been ignited by a scoring spark. "More than anything just seeing the ball go through the hoop has been big for me," Love said. "Just staying in attack mode, miss or make on the offensive end, making the right decision playing hard and then on both ends on the glass just trying to clean up as best I can." Add J.R. Smith and Kyle Korver's 3-point shooting, Tristan Thompson's rebounding and the Celtics, who boasted the NBA's best defensive numbers, will be challenged to shut down James and silence his supporting crew. "We know where the head of the snake is," said Celtics center Aron Baynes of Australia. "We know what we have to focus on. But he has got a lot of great role players around him and some other guys who can really create as well." The Celtics assembled a superteam in the off-season to threaten Cleveland's reign in the East, in part thanks to a major trade with the Cavaliers that hasn't brought a lasting impact. The Celtics lost Gordon Hayward to a broken leg against the Cavaliers in the season opener. And Kyrie Irving, obtained from the Cavs, is sidelined after left knee surgery. Isaiah Thomas, obtained from Boston in the Irving deal, was traded to the Los Angeles Lakers in February as the Cavaliers went dealing, landing guard George Hill from Sacramento, Larry Nance Jr. from the Lakers and Rodney Hood from Utah in a bid to find the right combination for another deep playoff run. Boston's Al Horford and Love will battle inside while Hill and the Celtics' Terry Rozier figure on another tussle in the backcourt. But in the end it will likely come down to James, who torched the Celtics in last year's East finals for 29.6 points, 6.4 rebounds and 6.8 assists a game. "He has been doing this a long time," Boston guard Marcus Smart said. "He's, if not the greatest, one of the greatest to do it."